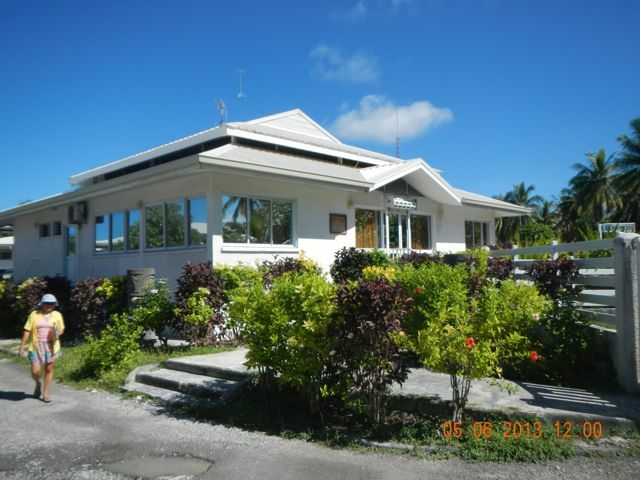 Rangiroa is the largest atoll in the world at 100 miles in circumference. 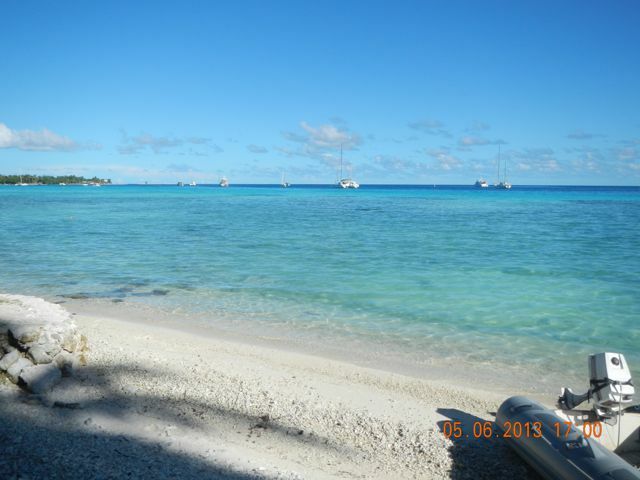 It's a French-speaking part of the Tuamotu Archipelago. 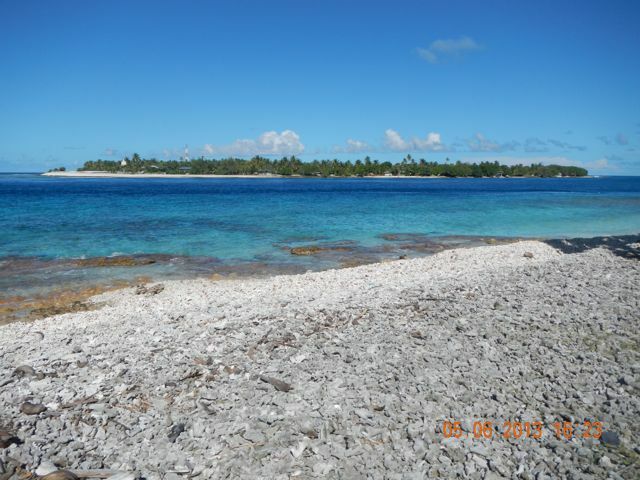 Atolls, as you know, are the remains of a volcano that has subsided while the coral growing on its flanks has grown upward. When the volcano is gone, the ring remains. There are only two passes into the lagoon, within 12 km of each other. A road crosses the various motus between and there's a village at each pass. 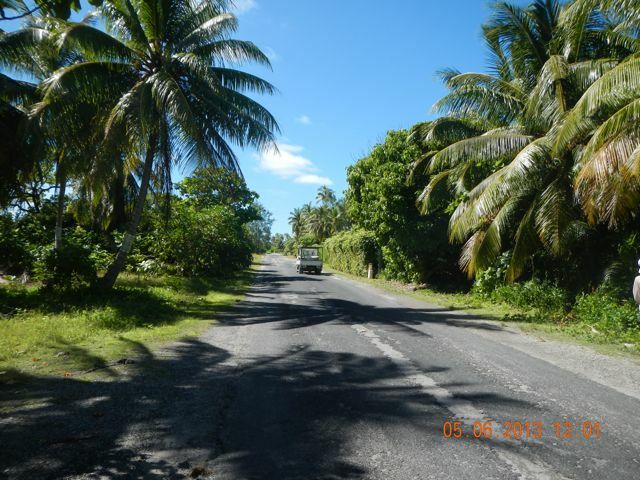 The 12 km of road is the ONLY road on the atoll! A few people live on other motus, but for the most part, people live within 12 Km of each other. Quite cozy. 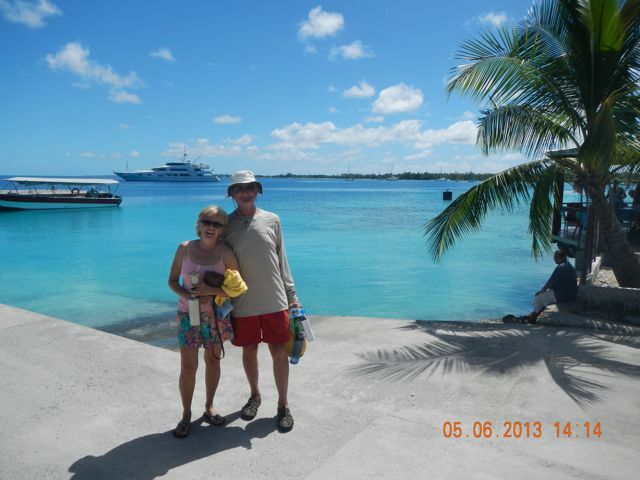 Rangiroa is what most people think of when they think of a South Pacific island: lush, green, hot and humid, motus covered in palms. 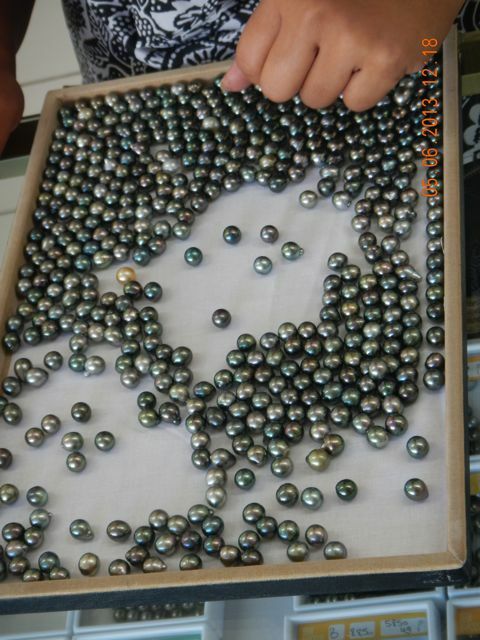 After our required check-in with the local Gendarmerie, we visited the Gauguin Black Pearl Farm nearby and spent several hours learning about the production of this lustrous and lovely gem. 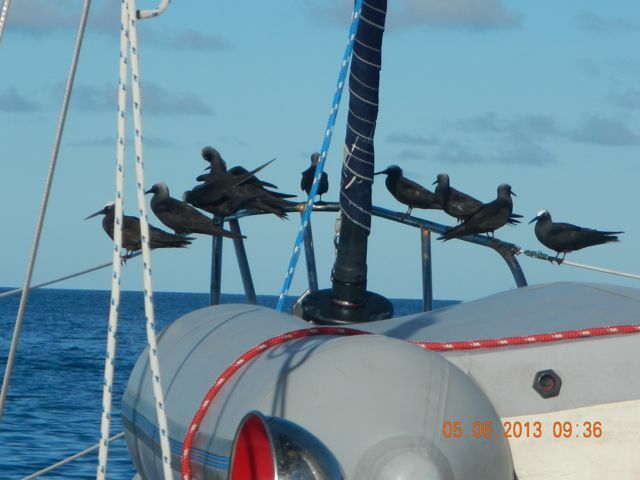 On awakening after our long sleep, we found these freeloaders pooping on our foredeck. Happy Conni with coffee and heat. We were all relieved to have arrived in the lagoon after the difficult passage through the pass. 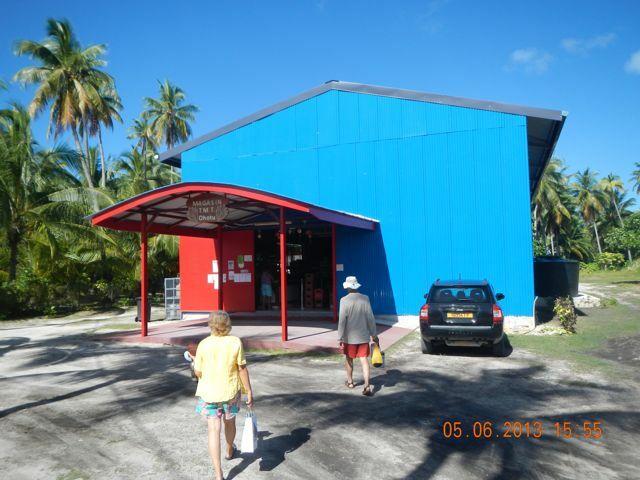 The Rangiroa Gendarmerie was lovely and was staffed by efficient and helpful people. No English spoken! 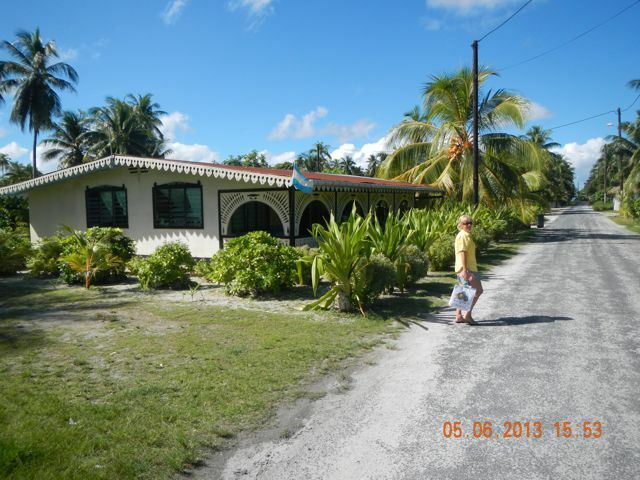 Leaving the Gendarmerie and heading toward the Gauguin Black Pearl Farm. What a lovely road. The creme de la creme: A+ pearls. The price is 184 Euros each. 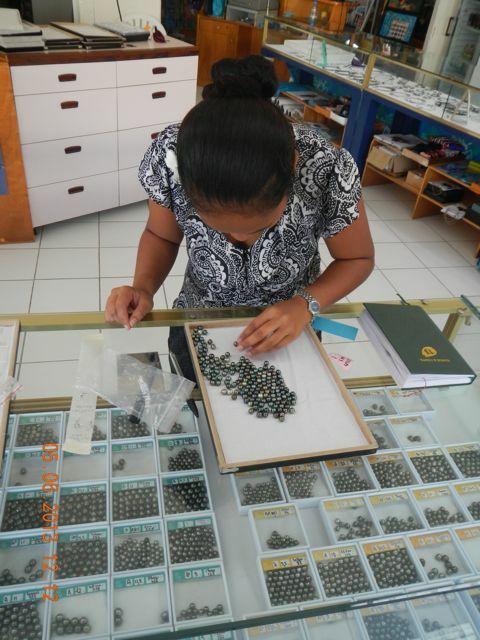 A LOT of pearls being sorted. This is a Black Lipped oyster. The lump she's pointing to is a pearl! This oyster was grown locally, and was allowed to grow for 3 years before being large enough to insert the seed. They're dropped into the water again, protected from predation, cleaned each 2 months, then raised and the pearl is removed from the oyster's appendix without harming the oyster. 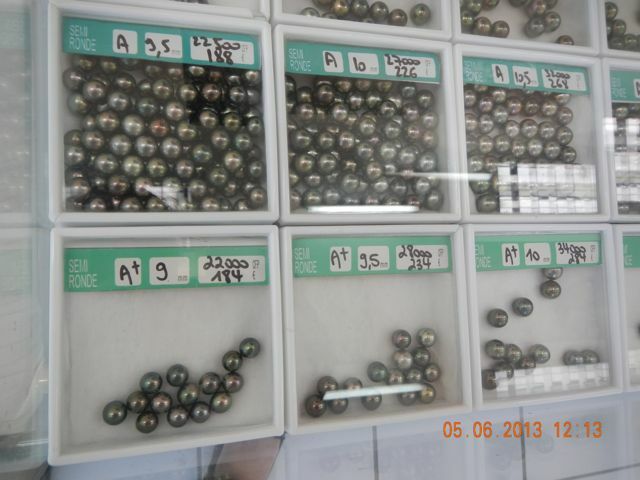 If the pearl is high quality, another, larger seed is inserted. If not, it's into the trash and the muscle is harvested for food and sold to restaurants. The two years, cleaning cycle is repeated and the pearl removed. If it's still producing a high quality pearl, another seed is inserted. 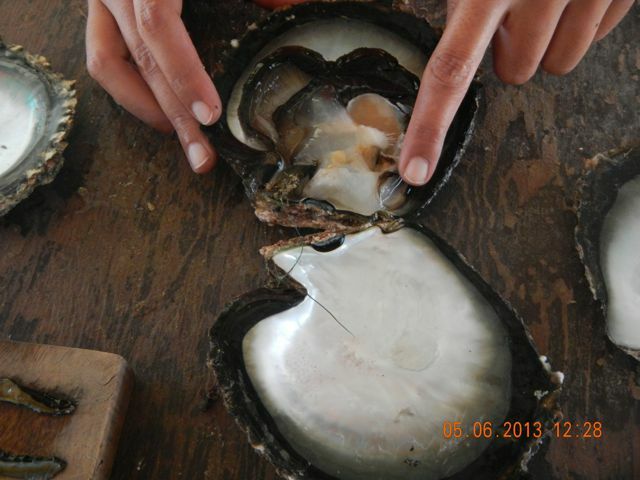 No more than two since larger pearls can't be removed without killing the oyster. Who knew? 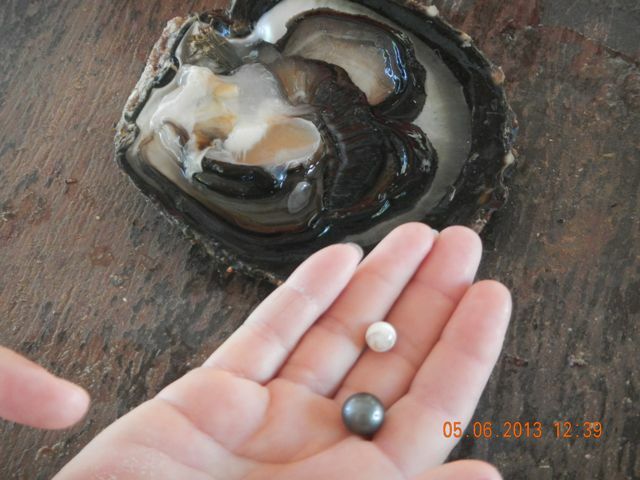 The seed and the actual pearl from this oyster. Oyster doc: the silver-handled instrument at left holds open the oyster no more than 1 cm, thereby not damaging the oyster by breaking the muscle. He slits the appendix, drops in the seed, drops in a dab of black-lip mantle to start the color process, and then closes the oyster. At right is the bin of betadine-coated seeds. Don't want any sick oysters! 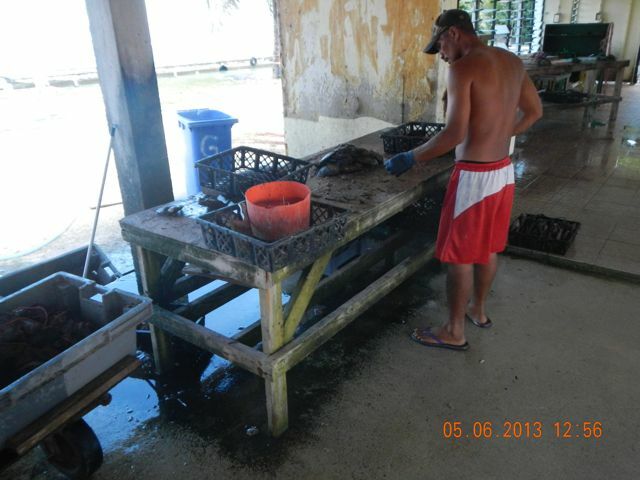 Every two months, every one of the 2 million oysters on the farm is cleaned so that it can continue to grow. Big oysters make big pearls. 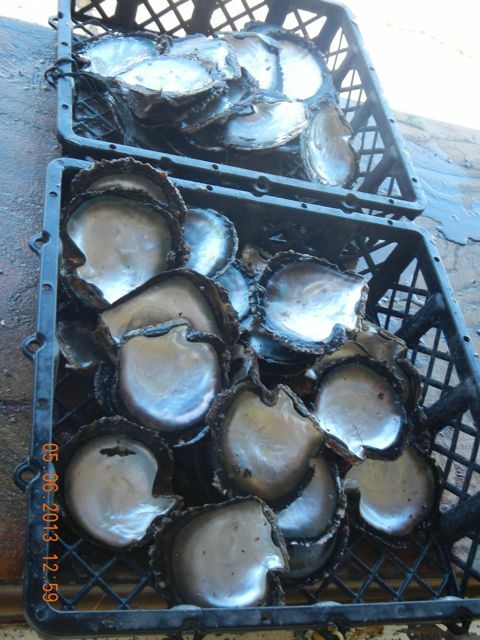 Oysters that don't produce good pearls the first go-round are opened and the muscle sold to restaurants. 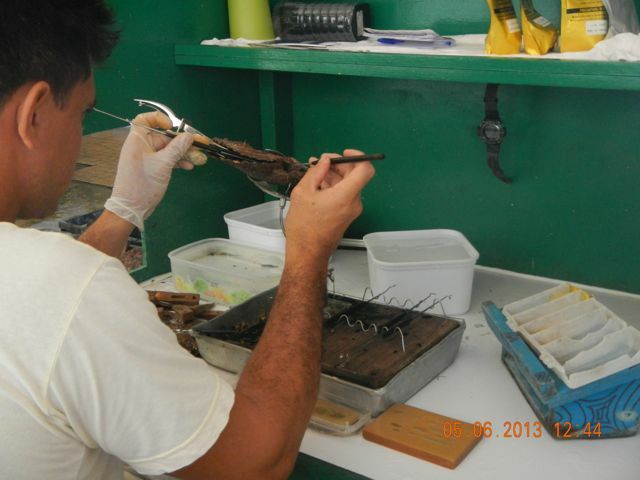 These shells are used for carving and the mother-of-pearl. The BEST. 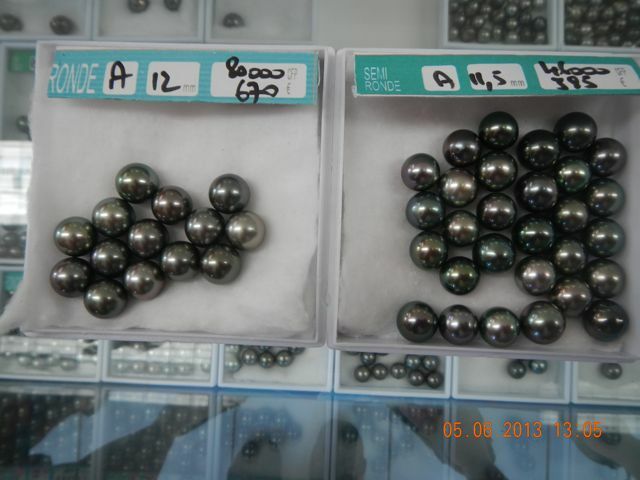 The pearls at right are 895 Euros EACH! They are 11.5 mm in diameter, no flaws (grade A), and have high luster and no flaws. 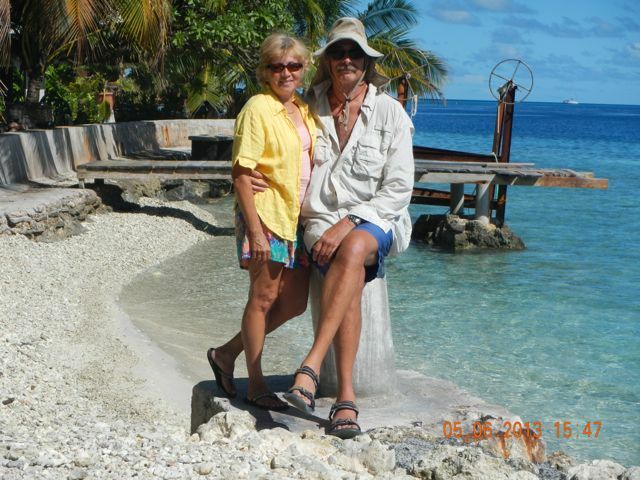 Of the oysters seeded the first year, only 25% survive and of that 24%, only 1% are grade A.
Conni and Chip enjoy the lagoon. 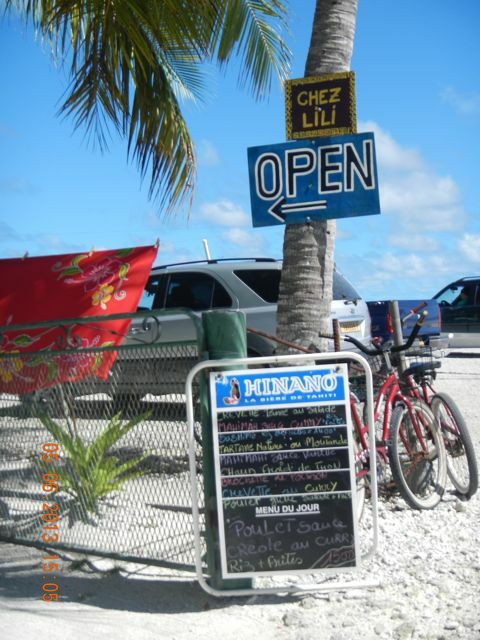 Chez Lilli's establishment where we had our great meal. Miss Lilly herself. 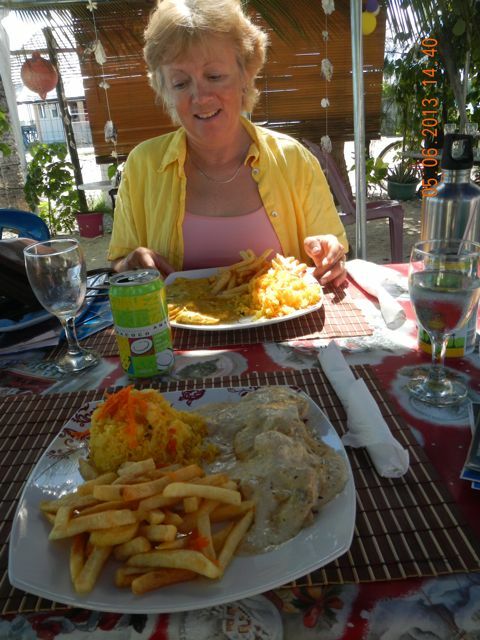 A transplant from Madagascar, she's a real fireball, as well as owner and chef of the restaurant. It's a local favorite. My mahi-mahi in vanilla sauce and Conni's mahi-mahi in curry. Both were excellent and filling. With this sign and menu, wouldn't you eat here? Our Christmas photo taken by Chip. Conni strolls by a lovely local home with "gingerbread" on her eaves. They all have open homes. One of the town markets. High ceilings help with the heat. Great variety? No, but the essentials are covered. Hey, it's a French island! Gotta be lucky to find baguette so late in the day. 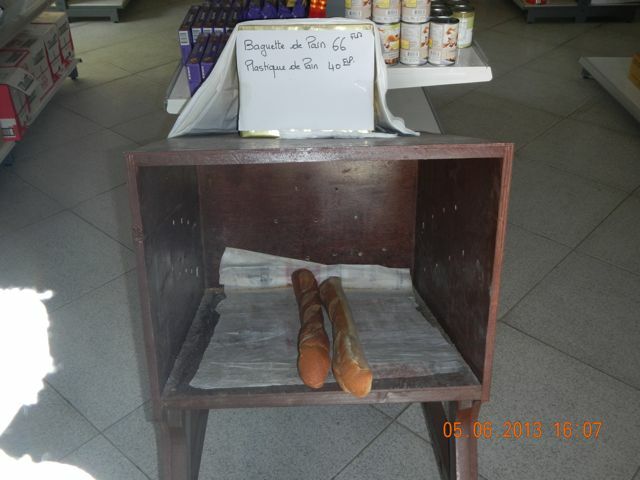 The exchange rate is 93 Francs to the dollar. Tiputa Pass. This is the scene of our major difficulties, but now under benign conditions. Yeah, we'll do better next time. It's easy to see the channel: the dark blue section in the middle. Since this drains such an enormous lagoon, the ebb is a river, causing whirlpools and big waves. 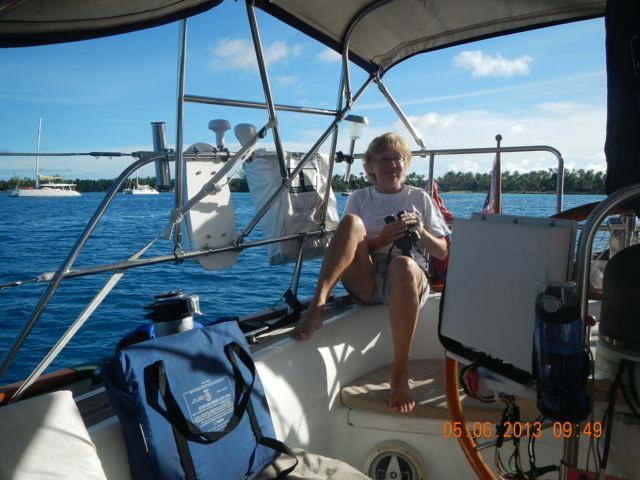 As the guidebook clearly states, wait until slack water! Hmmm looks like a coral beach. 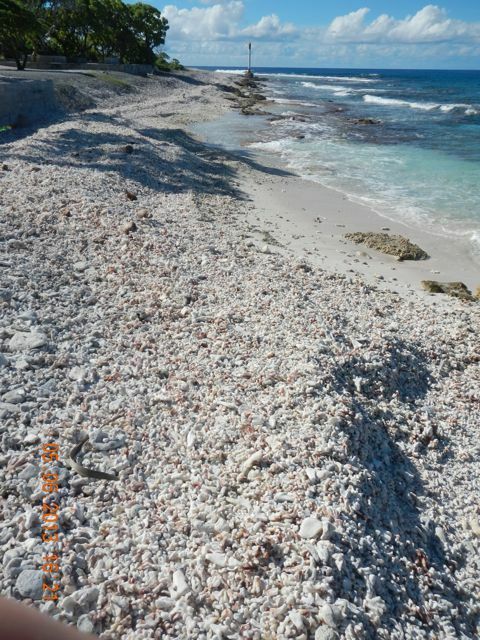 Beautiful white sand creates the beach: lovely. 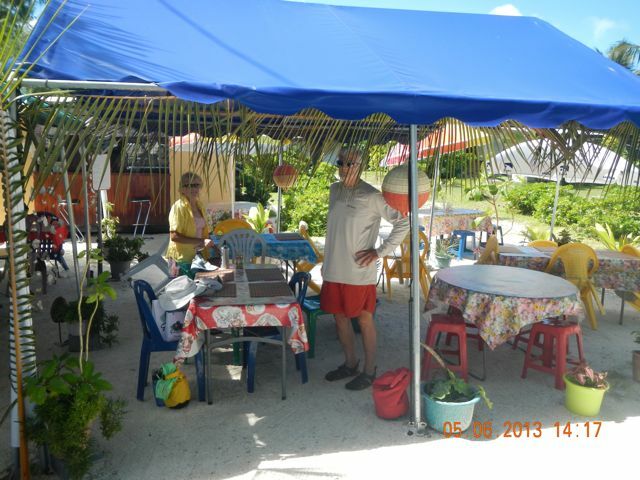 Our dinghy awaits our return to Top Dive's beach. Wings is in the far distance. This is the South Pacific.